The Ohio River has supported human life since people first settled along its banks thousands of years ago. Groups that survived on agriculture used the river to irrigate their crops. The river supplied water for drinking, washing, and a host of other needs. Rivers also provided transportation routes. Throughout Floyd County, prehistoric archeological sites show where Native Americans settled and how they used the river. 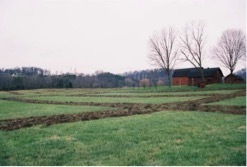 Cannon Acres is a partially excavated prehistoric site on the southwest outskirts of New Albany, on Budd Road. Large portions of the site remain intact below ground. Archaeologists excavated the site in the mid-2000s. They found the site consisted of two prehistoric sites and one historic site. To excavate, archaeologists systematically dug test pits measuring one meter square. 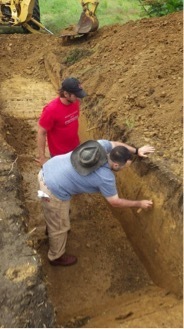 For areas disturbed by recent agricultural plowing, archaeologists stripped about ten percent of the exposed soil for testing. 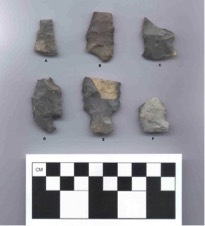 Archaeologists documented findings and excavated features. They determined Cannon Acres was most heavily occupied during the Late Woodland Period (600-1,000 A.D.). 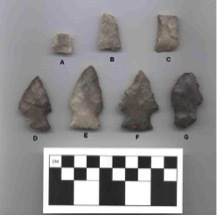 Some artifacts included Early Mississippian (800-1,100 A.D.) to Middle Archaic (8,000-5,000 years ago) projectile points. During the Late Woodland period and its predecessor, the Middle Woodland period (300 B.C.-600 A.D.), multiple tribes occupied wooded areas in the eastern United States. 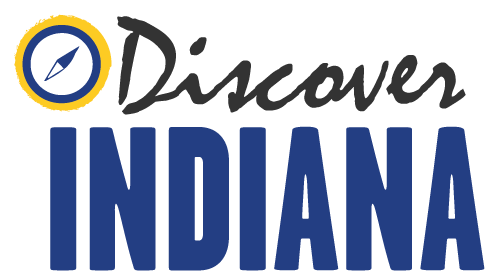 Indiana was full of Native American settlements. 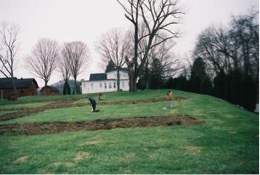 Prehistoric archaeological sites demonstrate the scope of Native American activities. Archaeological sites are often found near modern settlements. The same factors that attracted prehistoric peoples remain relevant today. In southern Indiana, the best-known prehistoric archaeological site is Angel Mounds. Built between 1,050 and 1,400 A.D., Angel Mounds lies on the southeast edge of Evansville. In its heyday, Angel Mounds was a large town occupied by more than 1,000 Mississippians. Eleven earthen mounds served as platforms to elevate important buildings. Angel Mounds is today an Indiana State Historic Site and open for visitation. Many prehistoric sites have yet to be discovered. Under Indiana law, digging on public or private property is illegal without a permit. Archaeological sites are valuable records of human activity. Leaving them undisturbed is the best way to protect their historical and cultural value. Ashley Slavey, Megan Simms, Wes Cunningham, Eric Brumfield, and Katy Morrison, “Cannon Acres,” Discover Indiana, accessed April 25, 2019, https://publichistory.iupui.edu/items/show/147. Published on Mar 31, 2016. Last updated on Apr 2, 2019.